San Francisco-based PG&E, the largest utility in the state, faces as much as $30 billion in liabilities tied to catastrophic blazes. Under California law, a utility is liable for property damage if its equipment caused a fire, regardless of whether there was negligence. Given that, some are asking whether utilities can survive in the nation's most populous state. Climate scientists and fire experts warn that more extreme wildfires are probable as higher temperatures scorch brush. Rain and snowstorms are coming later in the winter, increasing the risk that a spark will ignite parched vegetation. Fires in recent years have broken records for destruction and numbers of people killed. "The amount of liability is massive," said Sean Hecht, co-executive director of the Emmett Institute on Climate Change and the Environment at UCLA School of Law. "It's massive because climate change is making fires burn faster and hotter. ... It's also massive because we have more people living in areas that are more vulnerable. And it's also because utilities don't do as good a job as they ought to of maintaining all of their lines." Utilities are taking steps to lower risks, including removing vegetation near power lines, adding more fireproof equipment, installing weather stations to monitor winds and humidity, and mounting cameras to watch for flames. That will help, Hecht said, "but at the same time, even under the best conditions, the total amount of fire-related losses are likely to go up in the coming decades. Somebody's going to have to pay for that." A California law enacted last year, S.B. 901, ordered the creation of a Commission on Catastrophic Wildfire Cost and Recovery. It will study costs of catastrophic wildfires and make recommendations "for changes to the law that would address these costs and ensure equitable distribution among affected parties," Gov. Gavin Newsom's office said in a statement. The Democratic governor named members last month (Energywire, Jan. 24). S.B. 901 also required utilities to submit plans on how they will reduce wildfire risks. The first batch goes to the California Public Utilities Commission (CPUC) tomorrow, covering what they will do this year. Los Angeles-based Southern California Edison, among other steps, plans to add triple-layer covering over power lines. The first priorities are those located in about 600 miles identified as the highest-risk places for fires. SCE also is installing faster-reacting fuses that shut off power when they sense a problem. "It's our priority right now," given the damage caused by wildfires, said Phil Herrington, SCE's vice president of transmission and distribution. "It threatens every utility." Ten out of the 20 worst wildfires have happened in the last four years, he noted, adding, "That, to us, really marks a distinctive inflection point." 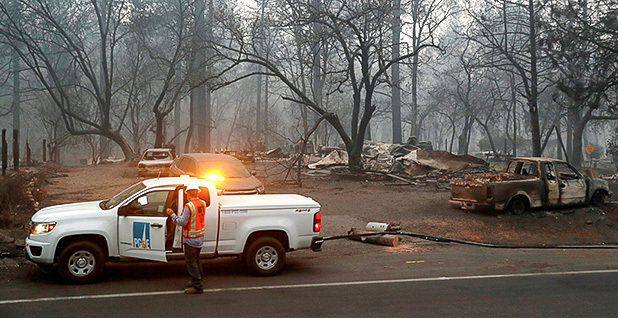 V. John White, director of the Center for Energy Efficiency and Renewable Technologies (CEERT), a Sacramento-based think tank, said the CPUC has failed to force changes quickly enough as wildfires have worsened. "What we have here is a climate adaptation emergency, and we haven't treated it as such," White said. Keeping utilities healthy is important for a number of reasons beyond keeping the lights on, several sources said. A state law that was enacted last year, S.B. 100, requires shifting to 100 percent clean energy by 2045. In addition, utilities have pledged major investments in electric vehicle charging stations and other EV infrastructure. "Having stable utilities that feel like they have the capital to make those kind of investments" is essential, Hecht said. Yet options for lowering wildfire liability are costly and have trade-offs, experts said. Some want to put more power lines underground. That's "incredibly expensive" and has major environmental impacts, said Severin Borenstein, director of the Energy Institute at the University of California, Berkeley's Haas School of Business. "You'd be digging up a lot of land disruptive to habitat," Borenstein said. Another alternative is making utilities shut off power when fire risk is elevated. Judge William Alsup of the U.S. District Court for the Northern District of California in a proposed court order said PG&E should de-energize lines during high-wind conditions. Alsup is administering a criminal sentence against PG&E tied to a deadly 2010 pipeline explosion near San Francisco. Another judge in 2017 put PG&E on five years of probation following a conviction on pipeline safety charges. Alsup is considering changing the terms of that probation. Alsup in his court order said de-energization should be done regardless of hits to profits or customer satisfaction. "Safety must come first," Alsup said. "Only safe operation will be allowed." San Diego Gas & Electric Co., a subsidiary of Sempra Energy, put a de-energization system in place in 2013, after facing multibillion-dollar liabilities for 2003 and 2007 wildfires. Since then, SDG&E has shut off power in high-wind conditions 13 times, said spokeswoman Allison Torres. SCE also considers shutting off power at high-risk times, using its own set of triggers, Herrington said. So far, it has done so rarely, once in 2003 and again in 2017. PG&E in a legal filing resisted Alsup's proposed order on de-energizing lines. "Shutting off power is not simply a matter of inconvenience. It is also dangerous — indeed, potentially fatal absent proper planning and the mitigation of unintended consequences," PG&E wrote. It can "leave communities and essential facilities without power, which brings its own risks and hardships," the company wrote. If PG&E were to shut off power when wildfire risk climbs, it would affect many customers, said Michael Wara, director of the climate and energy policy program at the Woods Institute for the Environment at Stanford University. There are taller trees and more rural homes in Northern California than in SDG&E's territory. Wara, however, argues it's the only feasible short-term solution. "The alternative is more wildfires and more costs," Wara said. The question is, "How do we avoid creating more of these people whom the utility can no longer afford to pay?" he said. The state should focus on lessening the inconvenience of power shut-offs, Wara said. Utilities, with help from the state, could get solar and energy storage installed in homes to ease the impact of turning off the power when fire risks climb, green energy advocates said. The state should start first by installing energy storage, solar and other backups at sites of essential services, including sewage stations and sites of water pumps, said White with CEERT. Legislature members are asking whether a PG&E breakup is warranted, said Geof Syphers, CEO of Sonoma Clean Power, a community choice aggregator (CCA) that buys power in the PG&E region. He's been monitoring the bankruptcy proceedings and talking to lawmakers and others. Lawmakers ask about it "literally every day," he said. "I have to believe it's on the table. ... They're asking the question." The CPUC has the power to make large-scale changes, Hecht said. There are some who argue that PG&E is "just too large to effectively manage the amount of infrastructure they have," he said. The commission does "have leverage to do everything up to and including potentially even requiring the breakup of the utility into smaller areas reflecting different service areas," he said. It could also order changes in the utility's management structure. Lawmakers also are asking how other aspects of the bankruptcy would affect CCAs and public power, Syphers said. He's urging them to take several months and "work out a thorough plan" that would prevent another bankruptcy by PG&E. The utility went through Chapter 11 reorganization in 2001 during the state's power crisis, when market manipulation forced the utility to buy high-cost electricity and it couldn't pass costs on to ratepayers. Some want to eliminate PG&E's shareholder profit motive. At recent CPUC meetings, people have lined up to urge the commission to make PG&E a public utility. Hecht, however, said there's no way of knowing whether that would reduce wildfire damages. Public utilities "have their own problems," he said, such as answering to elected mayors. "I would have to see the evidence that a public utility would be more effective in doing this kind of management," Hecht said. Some argue that the state needs to change its policy that makes utilities responsible for fire damages if their equipment ignites a fire, even when there's no negligence. It happens under "inverse condemnation," a state law on causing an action that leads to the taking of someone's property. The current situation "disproportionately burdens utilities for the damages of catastrophic wildfire. Left unaddressed, this issue risks increasing the cost of capital for utilities, which, in turn, increases customer rates," SCE said in a statement. Ralph Cavanagh, co-director of the Natural Resources Defense Council's energy program, proposed creating a pool to cover extreme incidents where there's no utility negligence. It could be funded by some combination of insurance companies and the state. The Legislature didn't want to address the inverse condemnation-related issue last year when it passed S.B. 901, Cavanagh said. That was in part because "they didn't believe that there was any bankruptcy risk" for utilities, he said. Changing that rule would affect insurance companies. They commonly sue utilities to recover what they pay out in claims when the utilities are found responsible for fires. If insurers end up picking up more of the costs, "you could see them ask questions about whether they want to participate in the California market," Wara said. California's Department of Insurance is seeing an "uptick in non-renewals" of fire insurance policies, state Insurance Commissioner Ricardo Lara said last week. He said he could not give specifics on how many residents haven't been able to renew policies or where they are located in the state. If insurers drop coverage, it pushes homeowners to the state-backed FAIR Plan. Lara resisted the idea of insurance rates rising to reflect fire dangers for houses near wildlands, saying, "The structures are already there." "Definitely, we need to have a comprehensive conversation when it comes to where we're building, how we're building, and how we move forward in terms of local land use and policies," Lara said. In New York after the 9/11 terrorist attacks, some victims waived the right to sue in order to get payments faster, noted White with CEERT. That's an option that should be considered for wildfires, he said. Lawsuits that fire victims file against utilities take years to resolve, which doesn't help people who need to rebuild homes, he said. "If you think about the scale of what we're facing, then I think we have to think outside the box," White said. He added that "we're going to have to figure out a way to pool the insurance risk."